Enjoy a free live jazz performance in the Atrium of the Main Library. All ages, no advance registration required. This month's featured artist is The Phil DeGreg Trio. To celebrate its opening, the Brewing Heritage Trail has planned three days of festivities, and cordially invites you to attend one, two or all three! Help Stop Panhandling. Cincinnati has a very detailed law controlling panhandling. See how it protects you. Additionally, here is a helpful brochure on how you, your neighbors and your colleagues can make change without providing spare change. Secure Your Vehicle. Learn more about how you can better secure your vehicle with this downloadable brochure from the Cincinnati Police Department. Membership has its benefits! A growing number of downtown merchants offer discounts to DRC members. See our current list. Why not join today? Please join us at our monthly meetings – 6 pm the second Tuesday in the Public Library Tower Room. Minutes for our last 12 meetings are available here. Volunteers Like Alan Bunker Make it Happen! Volunteering is a rewarding way for citizens to be engaged in their favorite parks. Those who volunteer their time for Cincinnati Parks directly contribute to a more vibrant and healthy community. The Park Board recognizes volunteers who go above and beyond to make outstanding impacts. During the January 2019 Board Meeting, Alan Bunker, a retired Forester, was recognized for his volunteerism. Alan Bunker began volunteering for Cincinnati Parks in spring of 2017. He approached Parks staff to offer his professional expertise as an arborist. 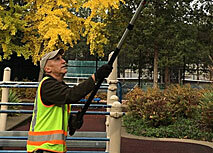 Alan initially worked in the East Region at Ault Park, but currently serves in the Waterfront Region parks pruning trees. Alan gives average of 3.5 hours of his time twice a week. His work consists largely of pruning, including all species of trees, pruning deadwood, and increasing clearance on paths and trails. He also helps with the plant containers on the Purple People Bridge. Alan has completed over 100 hours of service in more than 30 work shifts since September, 2018. He is a steward to conservation of our natural environment, and a dedicated public servant. Alan’s service is a true asset. He not only impacts the work of our staff with a professional skill set, but brings enthusiasm and appreciation to the staff and all who work with him. Thank you Alan! Volunteers make it happen. We can not do it without you! To learn more on how you can become an engaged volunteer strengthening your community, please visit our Volunteering Page. They’re here! Chico Lockhart, from Downtown Social Service Outreach, picked up the Heater meals that the Downtown residents raised funds for over the holidays to distribute to the homeless. 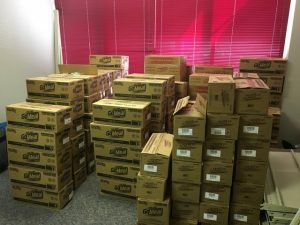 Thanks to all of you for your generosity! I have been a downtown resident for 6 years and have a true passion for this city, its history, renaissance and future. I currently publish the Downtown Residents Council Newsletter dedicated to keeping downtowners up to date on events. In addition I volunteer with the Riverside Food Tours, Shakespeare Theatre, Cincinnati Visitor’s Center. I believe that the DRC has a huge role in the future of downtown and its residents I would like to contribute to the DRC’s efforts to improve Downtown Cincinnati particularly for its residents. I am currently renting a suite at Hair@633 on Main Street where I cut men’s and women’s hair. I joined the DRC in 2017. I love the information I receive in a short, concise time – 1 hour, and I love the social aspect that the DRC offers. I like that the DRC helps give back to the city in simple, practical ways. I am interested in joining the DRC board because I feel that I should give back as well and I can provide an insight to the opportunities and challenges of being a small business owner in Downtown Cincinnati. I am a long-time resident of SW Ohio and in February of 2018 I moved to Downtown Cincinnati. In March I began attending DCR meetings and appreciated that the DRC provides the ability to stay informed and make a presence in the community. I have 34 years experience with the University of Dayton including roles on many committees and additionally on the board of a local sports organization. I would like to use these experiences to contribute to both the DRC and Downtown Cincinnati. I already help the DRC Events Chair with the regular Social Evenings. I moved to Downtown Cincinnati in November of 2016 and was impressed with the DRC especially its monthly meetings and weekly newsletter. Currently I volunteer at the Visitor Center, the Playhouse in the Park, the Main Library gift shop and I periodically work at Duke Convention Center at the information desk. In addition I help at Rothenberg Elementary on programs with the special needs and kindergarten class for the rooftop garden. I would like to join and assist the DRC board. I moved to Cincinnati for college at UC, and never left. I have worked in Greater Cincinnati primarily as a public health nurse for over 35 years. After retiring in 2013 I moved downtown to Current at the Banks and try urban living. However, I knew no one who lived downtown. Being a member of the DRC has yielded many friends. Currently I deliver DRC appreciation “snack” baskets to the area police. I believe that being a DRC board member would enhance my experience and knowledge of Downtown enabling me to help others enjoy Downtown. I am a public servant working as a Deputy Clerk for Hamilton County. On weekends I can be found working at a boutique benefiting the nonprofit Dress for Success. My professional experience as an Executive Assistant provided me with great opportunities expanding my knowledge in marketing, insurance, non-profits, startups, social services, reentry advocacy and event organization. I want to join the DRC board because I love this city. I want to get people excited about the great things going on in Cincinnati. Downtown Cincinnati is now home to over 6,000 residents, with more arriving every month as new condos and apartment homes are completed. The Downtown Residents Council works to develop a community atmosphere, conducts projects to improve the quality of life, and voices concerns of residents at City Hall. We work closely with the Police Department on safety issues and Downtown Cincinnati Inc. and 3CDC on development and promotion efforts. Help Us Stop Graffiti! Call it in! If you see graffiti on a building, sidewalk, rack, etc. please help us get rid of it ASAP. The longer graffiti stays up, the greater the invitation for more. Please contact DCI Ambassador Manager Zac Finch when you see graffiti. Zac will dispatch a team to photograph it, report it to the police and remove it. Zac’s number is 513-385-5075. Ambassador Hotline. To contact a DCI Safe and Clean Ambassador, call their hotline at: 513-623-3429. In an emergency, always call 911.